Home > News > Sanatan Sanstha and HJS celebrate ‘Gurupurnima’ all over India with devotion ! Sanatan Sanstha and HJS celebrate ‘Gurupurnima’ all over India with devotion ! ‘Gurupurnima’ festival celebrated at 109 places offering flowers of gratitude to ‘Gurumauli’, who is none other than the manifest form of Lord Vishnu ! More than 40,000 ‘jidnaysus’ take benefit of ‘Gurupurnima’ function held in 13 languages through ‘Facebook Live’! Mumbai : Few jewels in human form come on the Earth as if only to complete the mission of the Creator ! ‘Paratpar’ Guru Dr. Jayant Athavale is one of such virtuous personalities who has imprinted His own mark on the present age and that will last for thousands of years ! 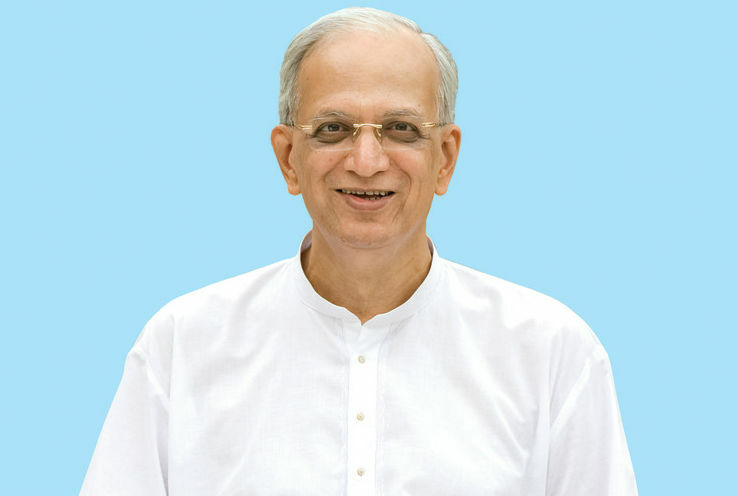 ‘Paratpar Guru’ Dr. Athavale is the ‘Moksha-Guru’ teaching seekers about spiritual practice as per times for rapid spiritual growth and God realization; He is ‘Dnyan-Guru’ who has written number of books imparting knowledge; ‘Hindutvavadis’ and Saints feel He is ‘Dharma-Guru’ and patriots feel He is ‘Rashtra-Guru’ who was the first to announce establishment of Hindu Rashtra; while He is ‘Jagatguru’ in a way who gives guidance on significance of Hindu Dharma and spiritual practice ! On Friday, 27th July 2018, ‘Gurupurnima’ festivals were celebrated to offer gratitude to this ‘Vishnu-incarnation’ in the form of ‘Paratpar Guru’ Dr. Athavale and His Guru Saint Bhaktaraj Maharaj by Sanatan Sanstha and Hindu Janajagruti Samiti. The functions held at different places were attended by Sanatan’s Sadgurus, Saints, seekers, devout Hindus and other dignitaries. The festival paying gratitude towards Guru, with full devotion, was celebrated with auspicious resolve of fulfilling the dream of establishment of Hindu Rashtra. 1. ‘Gurupurnima’ functions were held at 109 places all over India by Sanatan Sanstha and HJS in 3 languages viz. Marathi, Hindi and Kannada. 2. Maharashtra, Karnataka, Goa, Gujarat, Jharkhand, Madhya Pradesh, Bihar, Haryana, Andhra Pradesh, Odisha and Tamil Nadu are the States where ‘Gurupurnima’ functions were held and they were the beginning of establishment of righteous Hindu Rashtra at spiritual level. 3. In the morning session, ‘Shri Vyas-pujan’ and ‘pujan’ of picture-frame of Saint Bhaktaraj Maharaj, the source of faith of Sanatan and the Guru of ‘Paratpar Guru’ Dr. Athavale, was performed. Seekers were given guidance on the subject viz. ‘Perspective of spiritual practice and future course of action’. 4. In the evening session, message sent by ‘Paratpar Guru’ Dr. Athavale on the occasion of ‘Gurupurnima’ was read out. The divine energy in His words spread ‘chaitanya’ amongst the listeners, sowing seed of Hindu Rashtra amongst participants. Demos were presented on ‘First-aid’ and ‘self-defence’ invoking ‘Kshatra-Tej’ and were attractions of these functions; making people realize seriousness of forthcoming period of crisis. Short-film on self-defence was shown at some places. Guidance was given at few places by eminent personalities from society on the topics of ‘Nation and Dharma’. The guidance given by main speakers on ‘Secular democracy and righteous Hindu Rashtra’ made seekers, devotees, members of various Sects, well-wishers and ‘Hindutvavadis’ attending the programs become introverted and ponder over the issues. Thousands of seekers and devout Hindus joined the live transmission of ‘Gurupurnima’ function that was full of spiritual emotion and experienced immense joy. Guidance was given on Facebook in 13 languages such as Marathi, Hindi, Kannada, Tamil, Telugu, Malayalam, Gujarati, Bengali, Oriya, Assamese, Gurumukhi, English and Nepali. More than 40,000 ‘jidnyasus’ could get benefit of this function. Appeal made to participants to take oath for establishment of Hindu Rashtra ! The intellectual class in this country is propagating that establishment of Hindu Rashtra was just impossible considering the secular Constitution of this country. Hindus, however, need to understand the facts for repudiating such false propaganda. Today’s establishment of Dharma means giving alternate ideal governing system against secular democracy that will revive Hindus’ self-respect since democracy is leading to downfall of this country. There is need for all of us to learn matters related to Dharma, abide by Dharma and contribute, as per capacity, for Hindu Rashtra. The speakers made an appeal in their guidance to dedicate ourselves for establishment of righteous Hindu Rashtra, on the auspicious occasion of ‘Gurupurnima’. King of devotion, the title bestowed upon H. H. Bhaktaraj Maharaj (the Guru of H.H. Dr. Athavale), by His Guru, H.H. Anantanand Saish.